Material on this web site copyright © 1995-2019, TelePost, Inc. All rights reserved. Digital Power /SWR Meter, Waveform Monitor Scope and Modulation Spectrum Display all in one. Above picture shows the relative sizes of the LP-500 and LP-700 in comparison with other familiar pieces of equipment at N8LP. April 13, 2019 - We are in full production for the LPC504 3KW VHF (2 meter) couplers now, but shipments are slow because of our work load. If you are on the LPC504 waiting list, please be patient. LP-500 is a digital station monitor which displays detailed information about the transmitted signal of a station. It displays the sampled signals in numerous formats including Power/SWR, various oscilloscope type displays and a spectrum display. The sampled signals are obtained by demodulating the RF, like in a traditional wattmeter, and should therefore work on any frequency for which there is a suitable directional coupler with the appropriate voltage scaling and time constants. 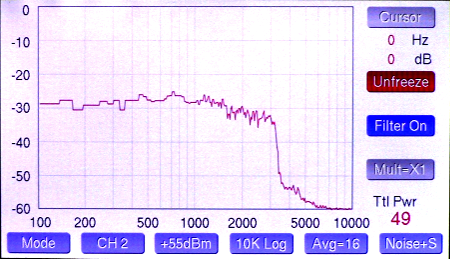 It should be noted that demodulated samples are audio frequency based and not the same as RF samples. With some types of modulation, the demodulated audio is not a linear representation of the modulation signals, therefore the spectrum display works quite differently than a true spectrum analyzer. This doesn't pose a problem for AM signals, where the demodulated audio is faithful to the modulation signal, but is a challenge for SSB and other signals without a carrier. For this reason, we have developed special test signals which allow for some traditional SSB tests to be performed, although the tests cannot be directly compared to measurements from a true spectrum analyzer. In many cases, though, similar information can be gleaned from the tests, and they can be used for comparative tests to see the effect of changes to the transmitting equipment. Click here to get on the LP-500/700 waiting list. Please include your call sign in the subject line to make automated sorting easier, along with your preference for LP-500 or LP-700. * The current wait time for a new listing is about 6 weeks, but as mentioned above, we are working on improving production rates. Note: Even though we hide your call sign for privacy reasons, there are ways for people to view it if they really want to. If you want total privacy, use an alias known only to you instead of your actual call sign. Open this file in Acrobat Reader to search the waiting list for your current position as we progress through the list. Each week we contact a group at the top of the list, then delete them. If you have dropped from the list and not heard from us, we either had an outdated email address, or the notice is sitting in your spam/trash folder. Once you have reached the top of the list, even if you missed the email, you are free to order at any time. You do NOT go to the bottom of the list! Please contact us by Email or phone (734-455-3716) if you think you missed the mailing. The file was last updated February 15, 2019. Note: You won't see your call sign, but you can still search for your position by entering your call sign in the "Find" menu in Acrobat Reader. Click here for LP-500/700 User Guide in English. Click here to join the LP-500/700 User Group. Reprinted with permission of ARRL. Click here for a gallery of LP-500/700 installation pictures. Click here for Encoder Mod for very early units. Free plug in daughtercard for early LP-500 / 700 to improve optical encoder response. Affects LP-500 with serial number below 00030, or LP-700 with serial number below 00018. Models later than these come with the mod installed, or on newer boards integrated into the main PCB. Email Larry if you would like one of these. * The list is used to determine seniority for regular retail sales of new production units. Excludes beta units, demo units, units used for development / testing and a small allotment of dealer orders. Firmware and software are posted in the downloads section of this page, along with firmware history, for those wishing to flash update their firmware. This is a fast and easy process once you have learned it. Instructions are in the User Guide on page 11. You can download the Bootloader program and the firmware by clicking here. Note: Users should report any bugs in beta programs to N8LP. Pricing - LP-500 pricing for the time being will stay at the original target of $650USD plus couplers (at least one required). The final cost of the LP-700 has been set at $720USD plus couplers, and will remain so. We currently offer the LPC-501 3KW PEP & LPC502 5KW PEP HF/6m couplers, and LPC503 10KW PEP HF coupler. LPC504 is in limited production, but should be in full production in a month. The LPC501 costs $150 ea, the LPC502, LPC503 & LPC504 cost $200 ea. N connectors on any coupler cost an additional $25 per coupler. Standard connecting cables (CAT6a) are 7' (2 meters) long. Other lengths are available up from 3' (~1m) to 20' (~6m). Of course, users are free to provide their own cables of almost any length. First video of LP-700, sitting side by side with the LP-500 and the LP-100A for size comparison. Due to the limitations of the HD camera, this is not a good comparison of the resolution of the displays, which is actually the same, but still a good comparison of size. This video shows the latest firmware and provides examples of some common operating and testing scenarios. Note: The video starts in Standard Definition, but if you click on the far right icon in the toolbar at the bottom of the video window, it will zoom to full screen High Definition. With a broadband connection, the video should be smooth and glitch free, even in HD. the LP-500 locally, or remotely using RDP or a USB Device Server. * 12VDC Operation / 800 mA maximum. CAT5/6 cable of any practical length. * Adjustable Sweep and Trigger with Memory. (w/ Bargraphs/Readouts for Positive & Negative Peaks). and are therefore not compatible. will continue with some important features not provided in the LP-500. (with LPC-501 coupler) Subject to change without notice. Absolute Power Accuracy… Better than 3% at 14 MHz, NIST traceable. A/D Converter 16-bit / 200ksps, plus oversampling (2X to 16X). Screen Refresh… 5 Hz to 70 Hz, depending on mode, sweep/span settings. 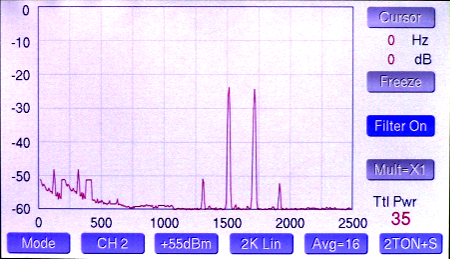 Sampling Rate… 2.5k to 80 ksps, depending on mode, sweep/span settings. Trigger Modes … Normal, Plus, Minus, Plus/Minus, Free Running. 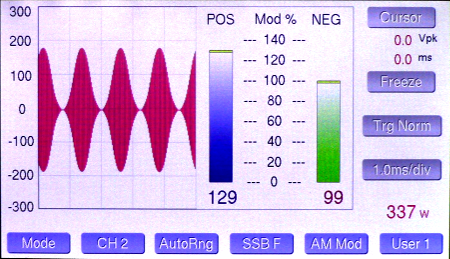 AM Modulation % … 0 to 150, positive. 0 to 100 negative. Additional Couplers will be available for VHF/UHF, lower power HF, etc. cable supplied. The meter has a protection diode to prevent damage in case of reverse polarity. The meter also has a built in replaceable 1A automotive type plugin fuse on the PCB for protection. the one mentioned above avoids the problem, but it’s still a good idea to bond all your equipment together. LP-500 using RCA cables. Two isolated pairs of connectors are provided for connecting two amplifiers. Use either pair for either amplifier. automatically recognize the LP-500 as USB HID (Human Interface Device). Ethernet cables. Unshielded (UTP) cables are probably acceptable as well. See Fig.1 on page 3. Test Tones: Audio output for built in test tones. 3.5mm mono. Connects to the MIC or LINE input of the rig. or copper braid. This will minimize pickup of noise on the test signal displays. generally DIN type connectors. Consult your user manual for specifics. 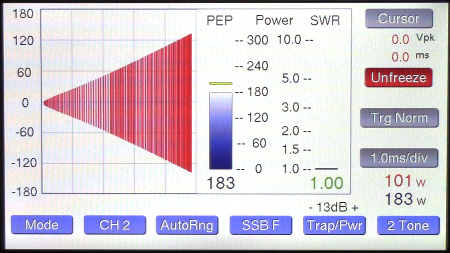 Main Power/SWR screen showing Peak Hold power value. Also shown in the bargraphs and small numbers are continuously updating peak and average power. 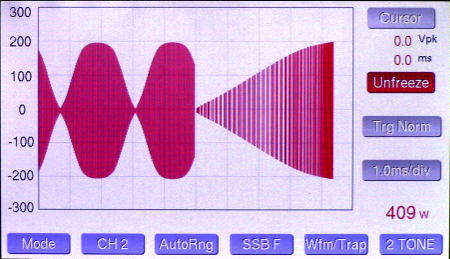 Waveform screen showing keying envelope with + / - edge triggering at 30 wpm. This allows display of both edges of the envelope at the same time. You can also see a slight drop in power putput over the duration of the keying element in this case. Also displayed are adjustable cursors, which in this case show risetime of the cw envelope (1.6 ms). The cursors work in all WFM modes and measure various parameters. The freeze button makes measurements easier. 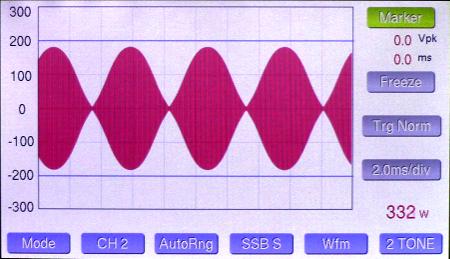 Two-tone SSB waveform using built in two-tone generator. Also shown are the peak power markers, currently set to 400W. 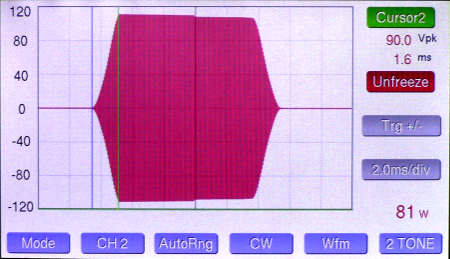 1/2 Trapezoid display showing amplifier overloading using built in two-tone generator. This view gives twice the resolution of a the standard trapezoid display. Waveform | Power/SWR split screen. Setup screen. The first three entries can be set differently for each of the four channels. LP-500/700 Firmware v2.51.30b2 (Version 2.51.30b2 is not compatible with VM versions older than version 1.076. Some of the new functionality regarding trapezoid display is not fully functional on VM yet). Note: Users should report any bugs in beta programs to larry. * Fixes bug on some meters with erratic behavior of CH1/2 trapezoid display. * Support for LPC-504 legal limit VHF (2 meter) coupler. * Fix for incorrect reflected power behavior in Peak Hld mode. * Change to USB routine to allow better access to power and SWR data for 3rd party developers. * Fixes firmware coding error that caused power to read about 5% high at power levels of 500W or more. * Improves averaging calculations at low power. * Removes the yellow sticky bar in the Tune mode. * Fixes a couple bugs in the last beta. * Changes the auto ranging so that it doesn't return to the base range until the end of a transmission. * Adds a reflected power readout (in watts) to the SWR window. * Fixes a bug in previous beta where the peak hold value occasionally didn't reset. * Addition of Slow/Med/Fast settings for averaging, using knob for selection. * Adds knob select button to Wfm screens to allow the user to select whether the adjust knob controls sweep or trap width (amp gain). * Changes power bargraphs in Wfm split screens to mimic the Pk Hold / Avg / Tune settings from the main screen. * Adds a couple error messages and an error beep sound to indicate improper button presses. Fixes bug from two previous releases. Changes trapezoid width (amplifier gain) adjustment from touch screen to knob control, and includes smaller steps of adjustment. Changes power display to 1W steps above 100W to minimize flicker in the last digit. Adds Trap | Power/SWR split screen. Improves accuracy of the meter at very low power levels. Improves behavior of AM Mod bargraphs. Adds enhanced support for LPC-502 and LPC-503 couplers in Wfm mode. Adds volume settings in Setup for confirmation beeps. Options include Off, Low, Med, High. Made improvements to the alarm system. Fixes Avg Pwr display in WFM modes, fixes SWR problem with VM. Change alarm indicators to make them more visible. See comments near the top of this page. Adds Tune mode (like LP-100A) and supports the latest VM software release. Fixes bug in v2.30 which caused the small blue peak number to the right of the peak bargraph to display the wrong value for time varying signals. 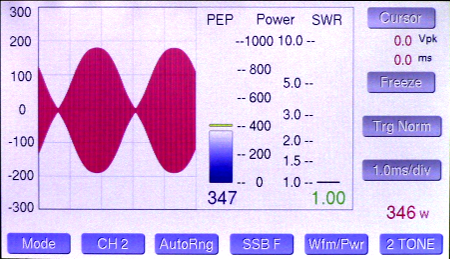 Added wattmeter "Peak Response" oversampling adjustment to SETUP. Choices are 50, 100, 200, 500 usec. This allows the user to decide how short of spikes he wants to allow the meter to capture. Fixed bug with the 60 minute sleep timer choice. Fixed bug associated with SWR Resting choice of "LAST" (wasn't displaying properly in WFM/PWR split screen). Added more timeout options to screensaver and sleep timers, including a sleep option of "Never Sleep". Bug fixes - WFM Range button recall value in 1/2 Trap display. CH2 Sweep recall value. Added 3W choice to AL Threshold Options and changed SWR numeric display averaging window. These changes produce more stable SWR indication while talking. Changed SWR Rest Fmt to eliminate a choice and fix the "LAST" choice. 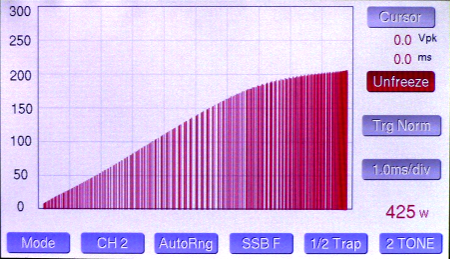 Fixed bug in v2.21 which didn't properly recall previous amplifier gain setting. Adds a gain selector to the trapezoid modes to allow the user to tailor the trap width to match the gain of his amplifier. It was determined that this was needed to accommodate the latest tetrode and LDMOS amplifiers which have considerably more gain than the FCC rules have previously allowed. The range is 12 to 26dB and is adjustable in the touch screen just above the trapezoid mode buttons. Changes the SWR display update algorithm in Peak Hold mode to narrow the range of displayable SWR variation during speech. Simplifies alarm system. 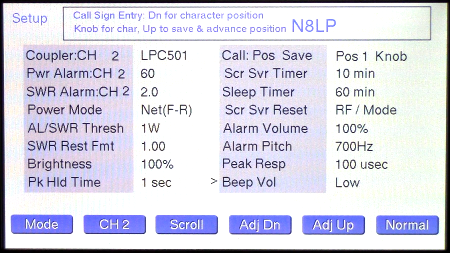 Expands call sign window to 12 characters. 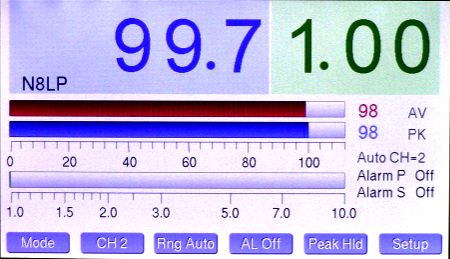 Adds peak power readout to WFM and Spectrum screens, changes AM carrier sense window. Fixes AM Mod bug & changes Cursor behavior in Spectrum mode. Required to flash new firmware into LP-500/700. See User Guide for details. Sweep slider on WFM screen. We will add these over time as soon as we can. Adds support for Trapezoid | Power/SWR split screen in LP-500. Added support for ranges above 3KW, changes some controls to be more universal across Windows versions. Updated installer because some users were missing a critical system file on their computers. Changes botton colors to match meter screeen. Fixes installer problem. Note: Uninstall older version before installing this one. Developmental version (work in progress). Split screens and Seup page not implemented yet.